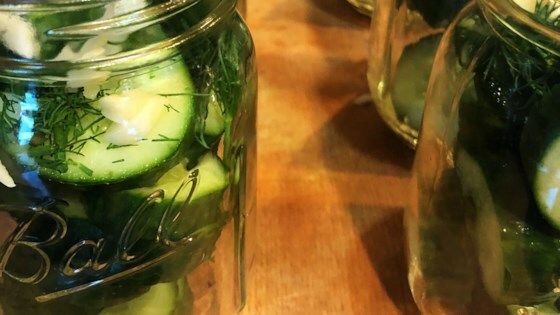 "These pickles taste so fresh and have just the right amount of dill and garlic. They taste great along-side a hotdog on a bun. They also taste great alone as a healthy snack. The pickles should be good for 6 weeks. Enjoy! You can also cut cucumbers into chips if you prefer a pickle chip instead of a spear." So easy! Absolutely delicious use for leftover cukes!! So great that it doesn't have as much sugar as other recipes! Followed the recipe exactly and it was yummy! This is my first time making any type of pickle. Can I keep the juice and keep adding cucumbers? thank you for the recipe!